Make it entertaining. Make it educational. Make it McWane. Nowhere else in Birmingham can you provide your guests with the high-energy, interactive experience awaiting them here, at Birmingham’s most unique education and entertainment venue. 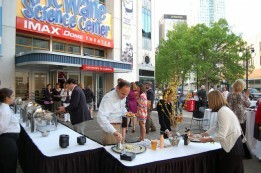 McWane Science Center offers full-service catering and multiple unique, but functional, event spaces perfect for your business luncheon, multi-day meeting, fundraising reception, employee appreciation day, wedding reception and more. With multiple private spaces available 7 days a week, including a 4,000 sq ft banquet room, IMAX Dome theater and four exhibit floors, McWane Science Center is the perfect venue to host a group of 10-500+ day or night. Please contact our experienced Special Events team at 205.714.8363 or email events@mcwane.org with any questions or to book a site visit today!